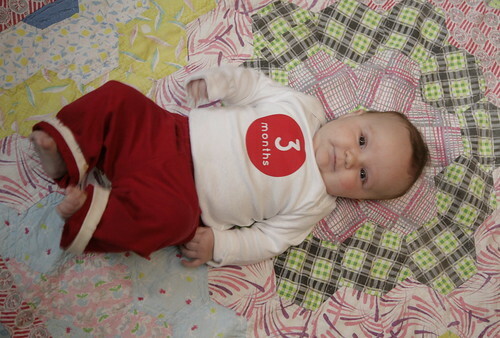 Inder Loves Folk Art: Three Months! Here we are: Three months! Maggie seems to get more talented (she can grab things and stuff them in her mouth!) and social (she can engage BART passengers in staring contests!) every day. She is a fairly serious baby, normally quite observant and contemplative, but when she smiles, it is with her whole body! We are adjusting pretty well to my return to work. My first day back, Maggie hardly drank anything from the bottle and didn't sleep much. When I got home, she had dark circles under her eyes. She latched on to the breast and stayed there for about two hours, just snoozing and nursing. For his part, Joe brought me his Lego guy and told me "The boy misses his mama." When I suggested that the boy go find his mama and give her a hug, Joe said, "No, his mama is gone. He misses his mama." Well, shoot, bring on the mother guilt, why don't you! Thank goodness, the second day went quite a bit better. Maggie is taking the bottle a bit better, and seems happy and contented (but still happy to see me) when I get home. And last night, Joe and I built a Lego house, and he put the boy and his mama in it, so I think we're okay! Whew. I love my kids. I have to work, and I really want them to be happy at home with their daddy, who loves them to bits. But I sure do miss them. Look at those cheeks! Smoochy, smoochy. What a cutie she is! Glad to hear your transition back to work is going smoothly... I know how rough that is! 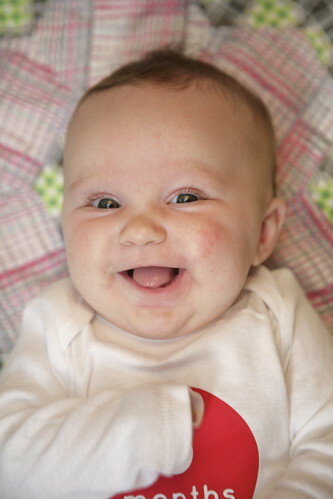 Oh my lordy that is a cute little beaming face! That smile is too much! You are such a great mom and an even better one for being honest with all us other moms. Mom guilt is the worst, but I'm pretty sure you'd feel pretty guilty if you couldn't buy food or pay the bills! I am so glad that things are smoothing out. Jude was a pretty serious baby, he would stare anyone and everyone down but only a select few got a smile out of the deal :). I love how their little personalities emerge so early! oh man, that's tough. i'm sorry the first day back was hard. at least you know your kids adore you. :) all of that make-up nursing will be great for your milk supply, too. you're a great mom and those pants! oh those pants! Awe, hugs to you!! i know it's hard...glad things are starting to somewhat get into routine. And my oh my loving those giggly pics! Aw! She is just adorable with that big grin! They are lucky to have a Mama who loves them enough to provide for them, and a Daddy they get to play with too! Hope it gets easier by the day. I am so glad they are home with their daddy but they miss mummy too. Thinking of you Darling Girl! i came back to say- i'll bet you'll really treasure these monthly photos. iris turns 1 on wednesday and i was telling dan that i sooo wish i would've done these with her. She has such a gorgeous smile. I hope you're finding a routine forming by now, it must be so hard on you but also make you appreciate the time you do have with your little ones even more. oh, i love that smile!!! !